Judging bears a negative connotation among most of the population. When we think about the idea of judging, we conjure up images of heated theological arguments and memories of condescending comments. Also, we remember how “judging” has historically escalated to injustice, tragedy, and violence. But is all judging wrong or sinful? We all judge. Some do more than others, but we all judge. If we know someone who routinely ignores stop signs, our courts would pass judgment. As believers, we repeatedly form and share judgments both small and large throughout each day. It’s a fact of life. The act of judging requires a standard. The private nature of the Western individual, desiring no accountability for personal behaviors and beliefs, inevitably clashes with the absolute truth of the biblical text. The Bible is inherently intolerant of deviating acts and teachings; God requires holiness (1 Peter 1:15-16). 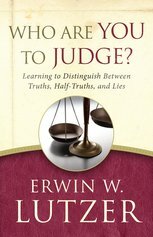 Does the Bible prohibit Christians from judging? Matthew 7:1-2 is the most common passage cited regarding the subject; indeed it is the only verse some people know. But after an examination of the context, these words of Jesus do not serve as a prohibition of judging but as a warning that we will be judged by the standard which we wield. If we move down further in the passage to verses 15-20, Jesus advocates that we evaluate (judge, discern) others by their deeds. This can only be accomplished by comparing someone to the Bible’s moral code, apart from a pharisaical self-righteousness. The instance of immorality within the Corinthian church also provides a helpful example. In 1 Corinthians 5, Paul is instructing the people of the church to act concerning a man who was in sin. He candidly concludes his exhortations saying that we ought to judge and expel wicked men from the fellowship of the church (verses 12-13). In this case, judging is not only allowed, it’s required. In general, the Scriptures praise this behavior (Revelation 2:2). Judgment among believers is not to be a reckless endeavor. Burdened with love for God and others, the believer must proceed with prayerful caution following the biblically mandated process for correction (Matthew 18:15-17). We must seek reconciliation, not alienation. Unfortunately, expulsion is sometimes a necessary conclusion. Our approach toward the world is supposed to be noticeably different than that of unbelievers (1 Corinthians 5:12-13). Some conflict is inevitable as a result from sharing the Gospel. Throughout the world, this conflict is epitomized through persecution and martyrdom. Apart from the Spirit, the cross is foolishness to the perishing (1 Corinthians 1:18). While continuously sharing and demonstrating the message of Christ’s redemption, we must remember that unregenerate people will act accordingly. Imposing Christian morality upon the godless can prove detrimental to the cause of Christ as it may produce self-righteousness rather than true righteousness in Christ. In this wicked age, the church cannot cease judging, discerning, and correcting wayward morality and destructive doctrine, carefully using God’s truth as the standard. Displaying an attitude of humility and submissiveness to the desire of God, we are called to speak out for the betterment of His people. With a constant hold on holiness, we must biblically judge believers and courageously reach unbelievers, exhibiting the love of Christ in every activity.